The other day as I was entering a friend’s house, someone was watching Sherlock Holmes. This is the Sherlock Holmes, mind you, the Jeremy Brett version that shall never be surpassed. It was a scene where he explains to Watson how he produces such startling effects with his deductions — namely, by describing the first link in his impeccably logical chain of reasoning, then the last link, and not mentioning any of the links in between. The other day as I was entering a friend’s house, someone was watching Sherlock Holmes. This is the Sherlock Holmes, mind you, the Jeremy Brett version that shall never be surpassed. It was a scene where he explains to Watson how he produces such startling effects with his deductions — namely, by describing the first link in his impeccably logical chain of reasoning, then the last link, and not mentioning any of the links in between. In this instance, he said that by looking at the groove between Watson’s left thumb and forefinger, Holmes had determined that the good doctor did not intend to invest in the Australian gold fields. Holmes goes on to explain the entire chain, which makes the whole thing absurdly simple. I mention this story mainly because if you see the latest version of Holmes, you’ll end up sick to death of the little montages they keep throwing in to explain how Holmes arrived at his latest improbable conclusion. He also predicts the future now, down to the last detail, and apparently shares a Vulcan mind meld with Moriarty, aka Jared Harris of Fringe. Let me back up. Jude Law of Contagion is also back as the long-suffering Watson, and the hapless Geraldine James returns as Mrs. Hudson. Eddie Marsan is also back for a split-second as Inspector Lestrade and Rachel McAdams is Irene Adler again, thankfully almost as briefly. These character names, however, are all you’ll find of anything Sherlock-like in this flick, which will not surprise anyone who’s seen more than ten minutes of the first. I still wish they’d just stop pretending that Robert Downey Jr. is anyone other than Tony Stark. Anyway, arch-villain Moriarty is here, as mentioned, and thank heavens he’s English. He wants to start World War I a couple of decades early and make huge profits on it. Noomi Rapace, who was Lisbeth Salander in the Swedish version of The Girl with the Dragon Tattoo, here plays Romany fortune teller Simza, whose brother has fallen in with Moriarty’s crowd and is being forced to help start WWI, or possibly is helping at least semi-willingly. I’ve just realized I’m not entirely sure. That certainly isn’t the weakest point in the plot, though. In a piece of casting that is both brilliant and horrible, Stephen Fry, the Cheshire Cat’s voice in Alice in Wonderland, is also in this movie as Mycroft. It’s brilliant because he can make any script good and funny, so I enjoyed his scenes in spite of myself; and horrible because now I will forever associate him in my mind with this mess. Plus he didn’t actually do anything to further the plot. I know, everyone else in the world loved it. I’ve tried to avoid the talk, but I’ve figured that much out. If you don’t mind lots of anachronisms, though, and have never read any Sherlock Holmes (or can just pretend you haven’t) then I can see liking this movie. There’s way too much bullet time stuff, but that’s usual these days, and the action sequences are generally good. There are also pretty girls, gorgeous scenery, and a really cool castle that’s unfortunately CGI. I don’t think it would be possible to build such a thing, but it looks wonderful. So on the plus side, Jude Law is still a really good Watson and there’s a good sense of camaraderie between him and Robert Downey Jr. (I make it sound sometimes like he can’t act, but it’s just that he’s totally wrong for the part); decent to good action sequences; a more interesting plot than last time; and a nice international feel to the story. For this, four out of five. 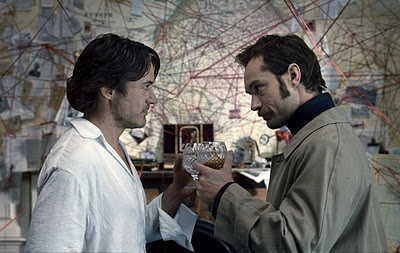 On the other hand, we have Robert Downey Jr. still unable to sound English, much less convince me that he’s Holmes; several minor plot holes; one gigantic plot hole; and enough historical inaccuracies to fill two pages in my little notebook before I gave up trying to catch them all. For this, one and a half out of five. Averaged together, that makes two and three quarters, and that sounds about right. Yes, I’m bucking the trend. I’m just trying to do my part to discourage them at least a tiny bit from making the looming movie #3 in this increasingly un-Holmesian series.